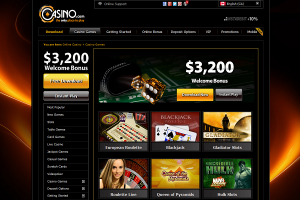 Casino.com was established in 2008 and since has been a global brand. It is registered under ONISAC Ltd. And it holds a gambling license from Gibraltar authorities. With its minimalistic black theme, the casino aims to offer a world class, state of the art, fun and user-friendly gaming experience. The game selection is rich, offering over 200 different titles. The welcome bonus up to €3,200 attracts many new customers that want to increase their winning chances over several deposits. The games are easy to find with the clear categories: arcade games, online blackjack, craps, live casino, online roulette, online slots, video poker, scratch cards, table games and card games. Apart from a few live casino titles, all the games have a practice mode available. With it, every player can learn to master a certain game before actually betting with real money. Playtech software, the provider for Casino.com, has been a leader in the industry for the last 10 years. The games are available both in software download and with flash player. The download version is available only for PC users, but the Mac owners can play the games from the dedicated browser. A multitude of slots are part of the offers: Novel Slots Diamond Valley Pro, Wild Spirit, Silent Samurai, Great Blue, Party line, Haunted House, Tropic reels, Fountain of Youth, Bonus Bears, Thrill Seekers, What’s cooking, Golden Tour or Vacation Station, amongst many other titles. Arcade games such as Keno Xperiment, Around the World, Penalty Shooting and Genie’s HiLo Jackpot can be played at Casino.com. If you like to play tables games or casino games, you will find Live Blackjack, Live Sic Bo, Live Baccarat, Live Mahjong Pai Gow, Mini Roulette, 21 Duel Blackjack, Wild Viking, Casino War, Poker Tree, Let It Ride, Hold’em, 10’s or Better, Joker Poker or Megajacks. The welcome bonus is offered for the first eight deposits, each worth up to €400, for a grand total of €3,200. The first deposit is 100%, with 40 times wagering conditions. Only the first bonus is a redeemable casino bonus and it expires after 30 days of no activity on the account. Residents of China are not eligible for this promotion. The reload bonus is awarded only if you have no more than €10 into your account. You can choose between two versions of the same bonus: with code RED, you get 100% up to €400, with 40x wagering or with code BLACK, you get 50% up to €400, with 20x wagering. The reload bonus is offered every Wednesday of the week. The loyalty program includes five stages: bronze, silver, gold, VIP and VIP Elite. For every wager that you place, you will be given one loyalty point. Values are different from game to game, but you will get one loyalty point wagering €20 at slots or scratch cards, €50 at roulette, €75 at baccarat or €200 at sic bo. The mobile friendly web page is compatible with iOS, Android, Windows or Blackberry smartphones or tablets. Blackjack, Roulette, and scratch cards have a different interface for the mobile users, to ease the controls. More than 30 banking methods, country specific are accepted to deposit and withdraw. Deposits and withdrawals are made via the same payment method. Deposit is instant, while withdrawal takes from two days for Skrill and Neteller, to a week for Visa, debit and credit card, or bank transfer. Customer service is covered on a 24/7 basis via live chat, phone or e-mail. Live chat is easily accessible from the website, without opening an additional window. UK, France, Germany, Canada, Denmark, Italy and Sweden have dedicated toll-free phone lines.